Model T Ford Forum: PAINT OR NO PAINT ???? PAINT OR NO PAINT ???? Model T Ford Forum: Forum 2018: PAINT OR NO PAINT ???? Can anyone tell me if the wood spokes on any or ALL Model Ts came out of the factory Painted or not Painted back in the day. Was that standard when you bought a T? Or have them painted later on. PS Would the owner then go to the long hard work to strip them down to natural wood after they bought them black ? wood spokes, and black cars had black wheels with black spokes. For the improved car in 1926 the spokes were initially only black, then an option for natural spokes, then an option for black wire wheels then an option for red, green, or yellow painted wire wheels. Any deviation from this would have been an owners modification. My understanding�and I could be wrong�is that some but not all Ford dealers made unfinished wood-spoke wheels available as spare parts. -If there's any truth to this, it would make sense that there be some vintage photos of Fords with varnished wheels. -I don't know whether such documentation exists. I have a 24 coupe like the one shown in your profile. When I restored it I had a new set of wood wheels built for it. I think it looks better with varnished wood wheels than the original black painted wheels so I varnished them. Yes a T's wheels were painted but unpainted wheels were avaliable sometime in 26. More than a few T's have varnished wheels. A purist would want them painted of course. But it's up to the owner which way you want to go. Jeff covered the factory way, for the early T's. 1925 was the intro of the 21" balloon tire wood wheel, and later in May 1925 Ford offered to the dealers p/n T-2911 Front, and T-2915 Rear 'natural wood wheels', these were varnished. The dealers could then exchange painted black 21" std. factory wheels for the non-painted but varnished wood wheels. These varnished wood spoke wheels were then of course made an option on the Improved Car, for the 1926 model year beginning in Aug. 1925. In the crate NOS wood wheels! Like some other things seen on antique cars these days, "natural" wheels on pre-26 Fords are a modern fad. As noted above, they didn't come from the factory that way. I assume there may be a period photo showing varnished wheels as an aftermarket accessory on a pre-26 Model T, but such a picture would be a mighty scarce item. For 1914-1925 I'll go with black, as God and Henry intended. Of course such a preference makes me that most detestable of creatures, a purist. As the old saying goes, TS. To add to Steve Jelf's post, varnished spokes came into vogue at the end of the wood wheel era - late 1920s into the early 1930s. I personally cannot get excited about varnished wheels because, in my opinion, they detract from the looks of a car. Unfortunately, the general public has been conditioned to drool over varnished wood regardless of species, grain pattern or how ugly or beautiful it actually is. Doesn't matter if it is a crappy piece of low end pine veneer plywood full of knots or high quality burled walnut. As long as it is varnished, they'll declare how wonderful it is. 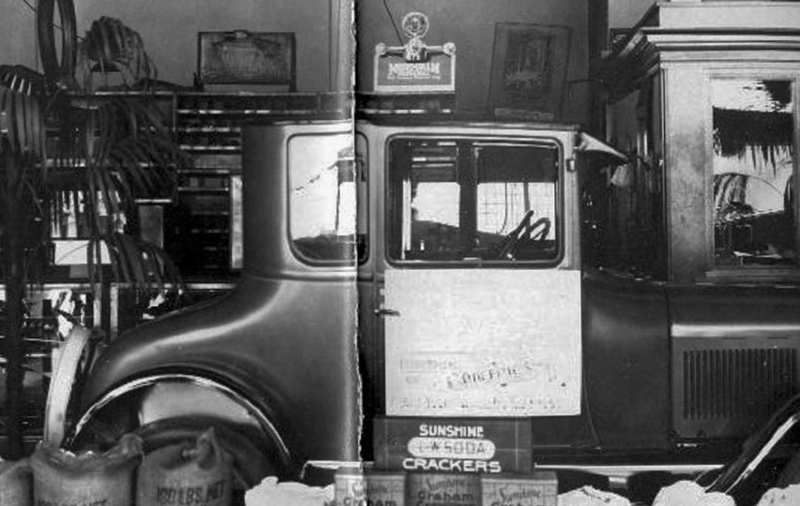 At the factories, Ford had little time for customizing individual orders for customers. The emphasis, back then was to get as many cars as possible out the door by the end of each production day. 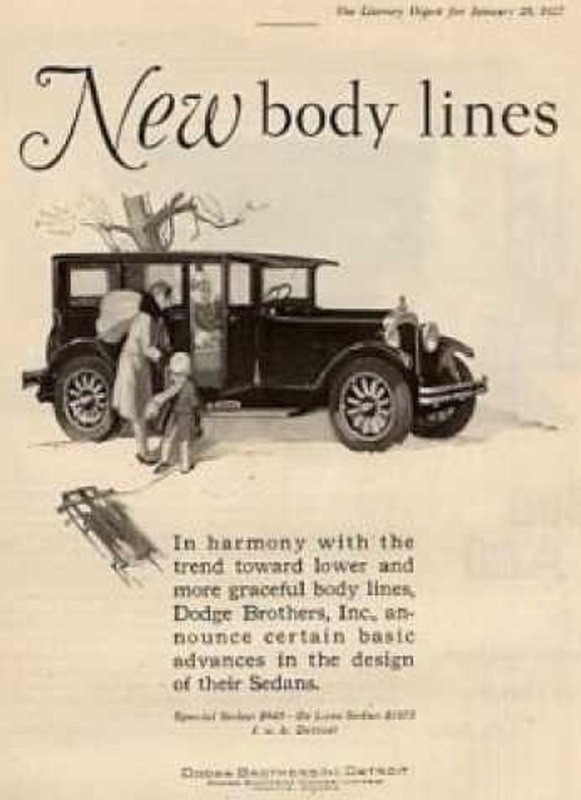 The 1926 & �27 improved cars (Coupes, Tudors and Fordors) had a two toned paint job with the body painted green or maroon and everything below the base of the body (fenders, splash shields, running boards, radiator apron and spokes) were painted black. I believe the hood shelves were painted the body color. Along the lines of Jim's comments about styles, it was only in the recent times (the fifties) that it became popular to strip the paint off old oak furniture and refinish it to show the grain. In the Model T era and before some things were varnished, of course, but the varnish of the times wasn't what we have today. This door from the old Silverdale Hotel, built before the turn of the century, is a good example of what often happened to old time varnish. The 24 Coupe that I inherited from my Grandfather has a September engine number so it's a borderline car. The 24 and 25 closed cars look pretty much identical. He had 28 Model A wheels on it that he had welded on the T hubs. My Father and I found the remains of 21" T wood wheels along the back fence so I assumed those were the wheels he originally had on it. I don't know for sure if that size T wheel came on it but I went ahead and used the wheels since they were supposedly the ones he had on it originally. He bought it it 1942. So what was on it before that time I will never know for sure. I wanted to leave it the way he had it except for the 28 Model A wheels. Have to address the styles that were in the late '20's and the varnished natural wood wheels added a bit of glam to ordinary cars of the day. The luxury brands were quick to do this finish on wood wheels, and the public reaction didn't "reminded them of axe, sledge Hammers and pickaxe handles". 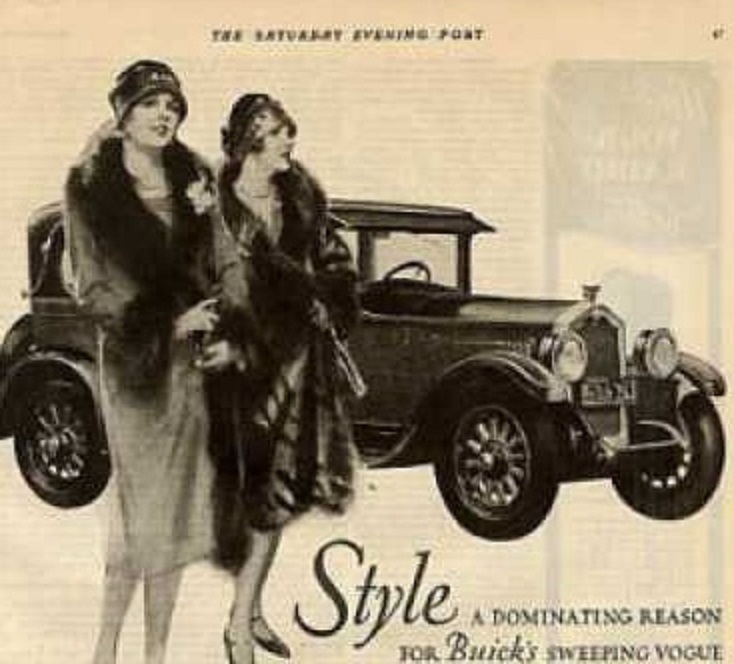 On the contrary, think there was a feeling of better off from the days of old, painted autos in many colors, and wood finished interior trim too, and wood finish natural wheels on these cars of the late '20's. 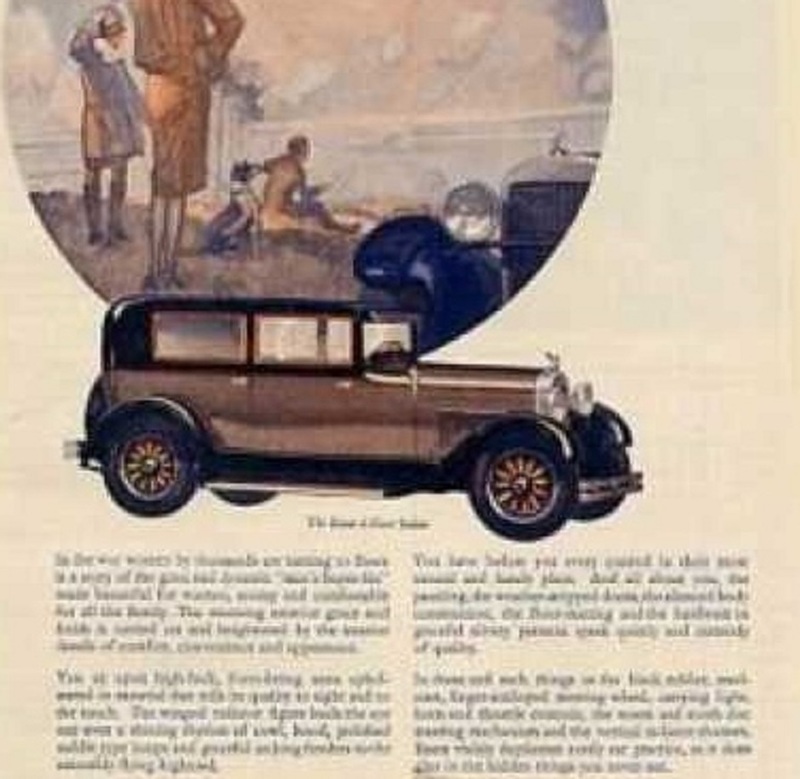 Then along came Edsel Ford as President of the company in 1920's and he set the trend for design, on the Improved Car, paints, and wheels with natural wood, like the bigger cars, Edsel did this knowing the public would buy! 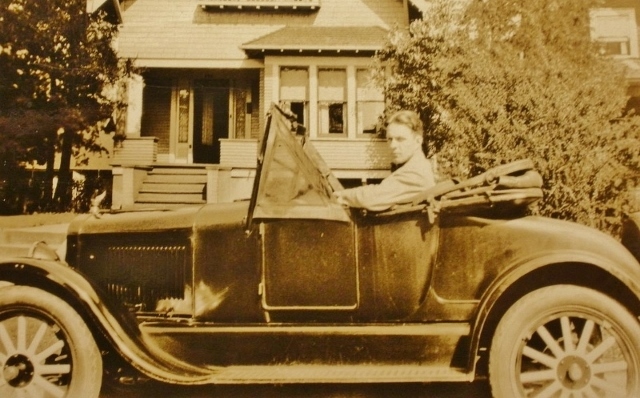 Later his designs of the Model A body types and colors set the public ablaze He even has the dash in the Model A painted wood grain! 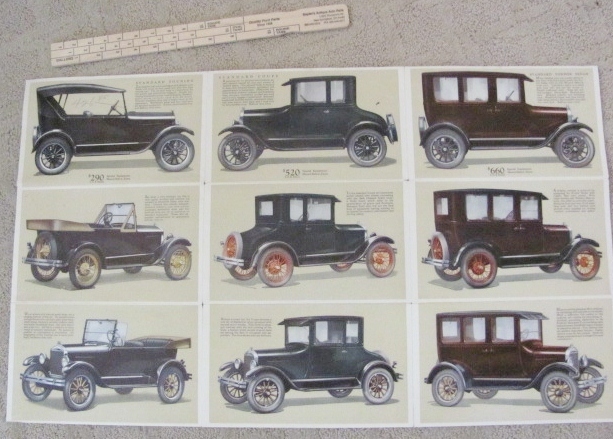 So the Ford in 1926 and 1927 was featured with natural wood spokes and many were sold that way, option at no extra cost! (Ref/ Service Bulletin, March 1927 "closed car customers desiring to replace wire wheels with wood wheels, in either black or natural wood finish should be accommodated without additional expense". My brother built a house in Missouri and specified oak baseboards and oak trim. Every house they looked at had trim painted white, so he built one instead. We wonder how long it will be before someone paints the oak white. It seems that is they way the do it down in the south. Same with wheels. I do not think you see many pictures of varnished wheels back in the day, even on the more expensive cars. Most folks don't comprehend that back in the days of the Model T wood was a raw material to build with. There was no plastic and cast iron was too heavy to use in abundance. Items constructed with wood were painted to give it a finished look and to match the other painted metal surfaces. Wooden pickup beds were painted as well contrary to the modern exotic finished oak ones we see today. Erik said it best- "the general public has been conditioned to drool over varnished wood". and...while most wood bodied commercial jobs were painted, the deluxe models featured natural wood for a reason....the bling of real wood, same with spokes, sometimes weak or bad wood could hide behind paint, less so with natural finish. When I rebuilt my wheels I varnished the spokes, and I will tell you why. I was at a car show a few years ago and two men were talking about my car. At that time I had black painted spokes. One said to the other that the old cars had wooden spoke wheels. The other said that they were aluminum made to look like wood. So there you are. I also like the look of natural wood. Hey, look�who's kidding who, here? -We all know what the wheels are supposed to look like. -Between 1909 and 1913, there were a few colors available, some even with pinstripes. -Between 1914 and 1925, pretty much all the cars came out of the factory with black-painted wheels. -A few colors became available again after that. Of course, there was once a virtual universe of aftermarket parts and accessories which was so widespread that almost anything short of electric windows might be considered "period-correct." -Yes, you could have bought aftermarket tops and even bodies which were not Ford equipment and you could mount that stuff on a bare-bones chassis that came out of the Ford grinder without a body in the first place. -But things like depot-hack bodies don't really represent the vision of Henry Ford. The reference for purists comes in the form of Mr. McCalley's book and it's pretty darned comprehensive. -For the purist, it eliminates certain fun items like ahooga horns, accordion luggage racks and runningboard-mounted toolboxes. -So, are you a pure-purist or a partial-purist, or are you just in it for fun and don't really care? -You can take it to any degree you like. As for me, I found that the vast, flat expanse of black across the side of a touring body was screaming for a little texture, so when I had my wheels rebuilt, I finished them in oil-stain and varnish. -They look great, but I'm not kidding myself that this is in any way original. If the car is not a static display in a museum, certain compromises may need to be made, even if only to satisfy the due diligence of basic safety. -So if you're going to be traffic-jamming cheek-&-jowl with modern cars and trucks, you need safety glass and an electric brake light; if your car has an enclosed body, you need turn-signals. -And everybody needs a loud horn. 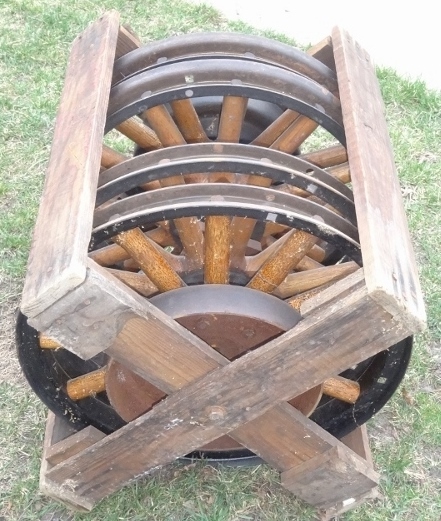 -Varnished artillery wheels? -Eh, not so much. Here is another example of changing aesthetics. I grew up in Eastern Penna and our house was built in the 1740s. These old farm houses were built with fieldstone walls. The walls seemed substantial but the wind did find a way through them and so the first thing people would do in the old days was apply a facing of white washed stucco. This helped insulate the walls and gave the house a more finished appearance. It hid the fact that the walls were made from cheap materials. By the 1920s there was a great interest in �colonial� heritage and many people removed the stucco to allow the stonework to be seen. And with that came fancy pointing of the spaces between the stones. This remains today and most people think it�s more authentic. I now live in Rochester where houses like mine built in 1919 had all the interior trim made from gum wood. Now gum is not the most beautiful wood and it was generally painted. Again ... now people strip the paint and varnish the wood because they are so excited that �real� wood was used in the trim. But even stained it�s not a very nice looking wood. 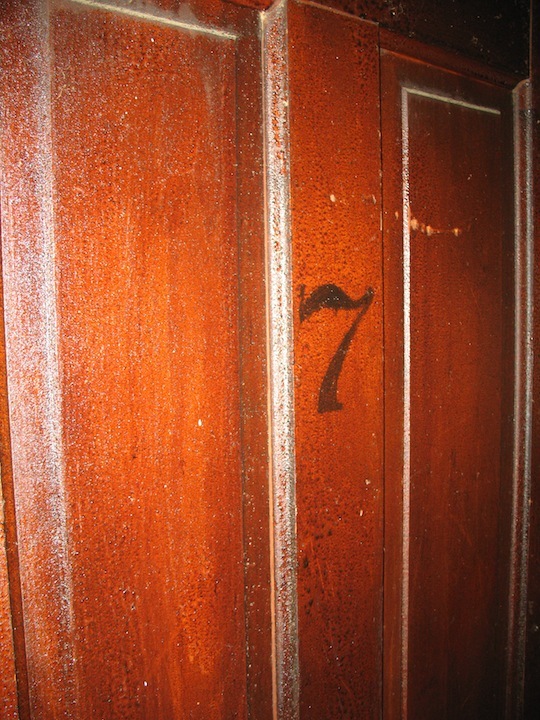 In the 1970s people were stripping the dark finish off on what we used to call Sears and Roebuck oak furniture. They would then give the light colored stripped oak a few coats of polyurethane. They simply didn�t know that the wood was originally meant to look dark and �antique� when it was made. The grain was always filled with a darker filler to bring out the grain. But that was the trend and it still exists. The spokes on a T are pretty much the same thing. The Ford company was just using a hardwood that was up to the task not for the color of the wood. Paint was the logical choice for cranking out cars quickly. But everyone is welcome to make their own aesthetic choices. Every era looks back and changes the aesthetics to suit their taste. An example of Mark's last sentence is women's hair in movies. With rare exceptions like Gone With the Wind and The Heiress, the costumes may be exactly correct historically but the women's hair tells you when the movie was made. Hood shelves on 26-27 I believe were Fender color(Black) not Body color. Never seen a NOS piece any color but black. Wish I could better document this but maybe Dan can. My observation go back more years than I like to admit. Comment welcome. On the black era cars, especially the lowly Touring cars, I like black everywhere, including the wood spoked wheels. Heck, even the silver rims bug me a little bit. All blacked out, they truly have that humble servant look for which Henry designed them. One of the minor pet peeves I had with the Model A crowd, when I had my Model A, was that seemingly every owner would restore their car to the most flashly, most highly optioned version possible. It got to be monotonous. I like the look of a black on black on black Model A. They just look cool that way. You are correct, the hood shelves and the hood latches on the Improved Cars are painted chassis color such as the fenders, splash shields, etc. in baked-on Black. Only on the color painted Improved Cars are painted color on the body and the hood. Note in this photo, many bodies were body color under the rear fenders, as that exposed body panel is color when the body is painted in color. The black rear fender hangs over the color body. And the Pyroxylin spray color wasn't rubbed to shiny finish, remained in a satin hue. Note: The 30X 3 1/2 wheels never were available with a natural finish, even in 1926. Dan, any documentation in regards to satin finish on improved cars? Older post on the subject of Pyroxylin paints on Ford. And photos of original new Fords in color show the difference in body sheen over the baked-on enamel of the chassis parts. Now the first Improved Cars in color used enamels, like M-392 Channel Green, and that paint was higher sheen than the Pyroxylin. So closed T's in model year 1926 in the first enamel colors of maroon and green would be more shiny. Here is another ref. from auto trade journal of the day writing about Ford's new finish in lacquer. Jim, with all due respect, I really have to take exception to your statement - "like . . . everything else on the Model T . . . Ford sacrificed quality for price." 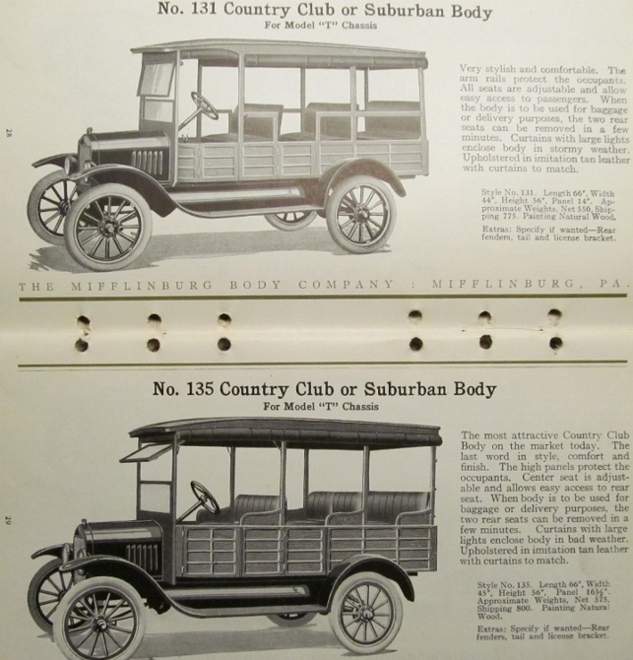 The evolution of the Model T in production shows that efficiency and economies of scale were applied to reduce the cost of the car to the buyer. Eliminating brass, developing steel stampings in lieu of castings and forgings, all were pointed toward efficiency and economy of means, while the actual functional quality of the product was often improved - rarely diminished. 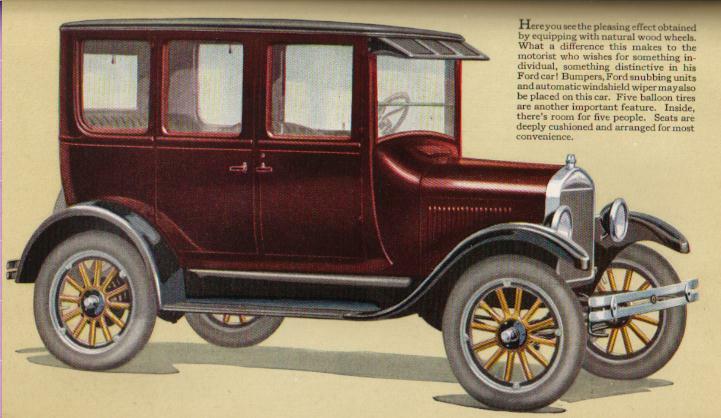 Arguably, the Model T was in essence a "low quality car", perhaps, but Ford improved the base-line standard of quality the Model T embodied through 19 years of production. Paint was no exception. The "all black" decree arose from incorporating a paint which could be produced at low cost without sacrificing durable quality, and "Gilsonite" was the answer. As a fossil resin which could be made into paint, its sole drawback was being black, precluding the use of other pigments to produce a variety of colors. The paint was surely as good or better than any other formulations in use at the time. 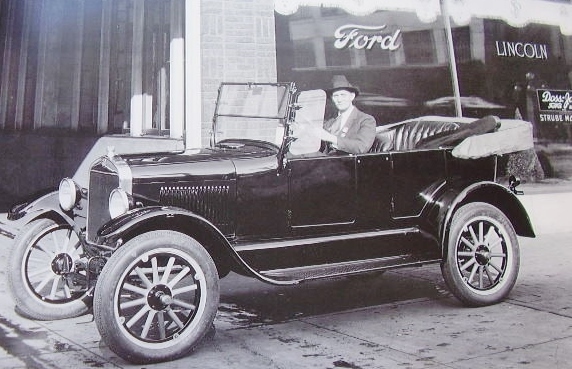 Pyroxylin (nitrocellulose lacquer) was "new" at the time the improved Fords were produced, and its rapid drying enabled Ford to offer limited colors without slowing production. Not a "wet-look" gloss, certainly, but if owners regularly polished their cars, lustre would improve, just as today, if a restorer opts for it, and buffs out the finish. It's certainly a good idea to use the best paint you can apply, but "new" doesn't always mean a paint product is much improved over the previous generation of coatings, or is going to be eternally durable. Since Jim painted his T in 1980, many coatings have become much less durable than those produced in that generation and before, mostly because lead compounds have been eliminated or restricted. I don't know for sure what Ford did, but I don't see why skipping a step and replacing it with a equal step would add significantly to Ford's production costs. Why not varnish some wheels for extra bucks? Hope everyone has a great Christmas. Got a great laugh about the comment that suggested dealers made wheels with unpainted spokes. Of course the did because then the buyer could paint them any color they wished. Including black or clear coat. My '17 would have been built with black painted spoked wheels but somewhere in the past an owner replaced them with wheels that had demountable rims. The spokes show no evidence of ever being anything but varnished and that is how they will be on my car. This might be a point that has not been covered. The black wheels were assembled dipped and spun. The varnish wheels, the fellows, hub, hub plate and maybe the exterior of the brake drum might have had to have been painted separate before the wheel was assembled along with then painting the hub bolt heads. ? I cleaned up the wheels on my 23 Touring, best I could and leaved them with a nice patina of old wood. I like them that way and get LOTS of compliments on them. My Speedster wheels were rebuilt this year by Stutzman Wheels, fantastic looking natural wood, and they are staying that way. I found that folks can hide dangerous wheels by filling in cracks and defects, then painting to look beautiful. 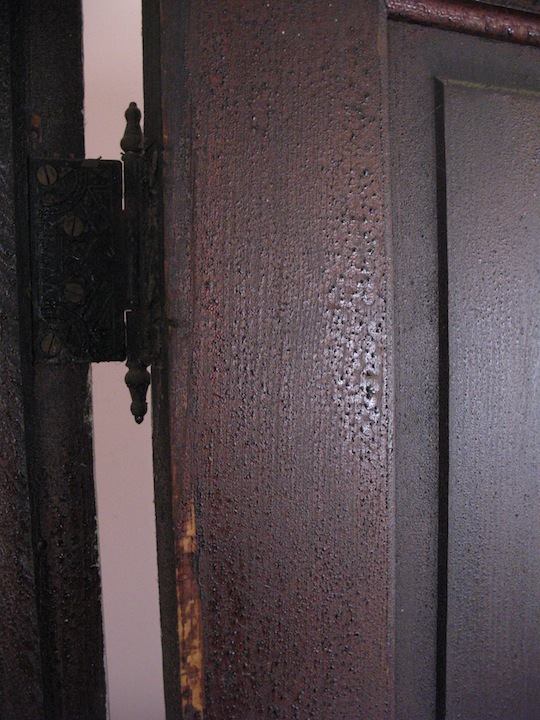 With Natural wood this practice of hiding defects is somewhat eliminated. It's your T, enjoy it anyway you like, most folks simply enjoy seeing one and have no idea how it should really look. Seeing as wheels were dipped, spun and the brake drums were painted separately would there be a variance of color between the two processes. What I am suggesting is matte or satin or semi-gloss or gloss. I know black is black but, not really! I don't know that the brake drum was panted separate, I think there was a clamp or plug so paint did not get inside along with the hub cap end. Even if it was painted separate, I do not think Ford would have been real concerned if there was a little color difference.